This hardy fern is a native to Japan and sports a beautiful coppery – red color on lush green fronds, when mature the leaves will fade to green. In most areas Autumn Fern is evergreen and will grow 18” to 24” tall and spreads slowly up to 15″ wide. 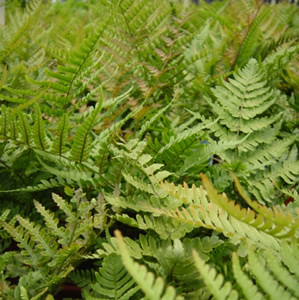 Dryopteris erythrosora is great for shady areas such as under trees or for areas with morning sun only.